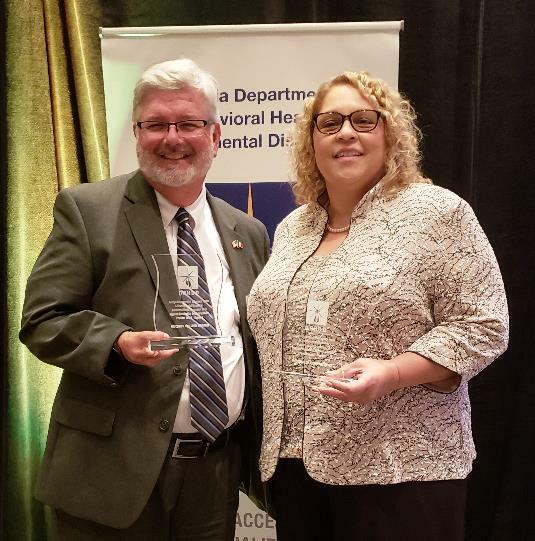 On July 31, 2018 the Council on Alcohol and Drugs was presented with the Provider of the Year Award for our exemplary substance abuse prevention services by Travis Fretwell and Donna Dent from the Office of Behavioral Health Prevention, Department of Behavioral Health and Developmental Disabilities (OBHP/DBHDD) at the 2018 OBHP Prevention Conference: Community Heroes: Rising Up/Taking Action. Mr. Wade (right) was awarded the first-ever Director’s Award during a plenary luncheon on July 31 at the 2018 Office of Behavioral Health Prevention (OBHP/DBHDD) Conference on Jekyll Island (Community Heroes Rising Up/Taking Action). The award was given to Mr. Wade by Travis Fretwell, OBHP Director, for Chuck’s tremendous accomplishments as the Executive Director/CEO of the Council on Alcohol and Drugs. Also, Ms. Afiya King (above) won the 2018 Ray Avant Excellence in Prevention Award. Ms. King received the award at an Awards Luncheon during the GA School of Addiction Studies in Savannah on August 30. Only one Georgia preventionist wins this award each year for their lifetime accomplishments. Harry Stevenson (left) and Ester Lopez won the Regional Provider of the Year Award in Region 5 and Region 1, respectively, at the Oct 3, 2018 Awards Dinner at the DBHDD Symposium at Lake Lanier. Kevin Daniels (left) and Harry Stevenson won the Regional Provider of the Year Award in Region 5 at the Oct 3, 2018 Awards Dinner at the DBHDD Symposium at Lake Lanier. April 26, 2018 - Camilla Herndon (left) and Kay Manning were honored at the UGA College of Public Health Practice Advisory Group meeting at the University of Georgia! The Practice Advisory Group meeting is an awards luncheon that serves to honor exceptional field placement supervisors and UGA public health student interns. Kay was honored with the Preceptor of the Year award for her role as an internship site supervisor and Camilla was honored with the Student Intern of the Year award. Due to its Red Ribbon activities in October 2012, The Council on Alcohol and Drugs won the 2013 Statewide Red Ribbon Award for Best Community-Based Programming and Projects and was the overall winner being awarded the Perpetual Trophy for outstanding efforts during Red Ribbon Week reaching more than 43,000 people during their awareness campaign. These awards were received from the DBHDD Commissioner at an awards ceremony at the Woodruff Art Center. This Award was a result of the efforts of Ester Lopez, Kay Manning, Afiya King, Harry Stevenson and Dr. Gregg Raduka working with many partners in their respective regions, coordinating activities and bringing awareness during Red Ribbon Month in October. SUPER (Substance Use Prevention and Education Resource) Stop! is a program based on SUPER which won a National Exemplary Program Award from the US Department of Health and Human Services, Substance Abuse and Mental Health Services Administration (SAMHSA). This award was won mainly for obtaining outstanding evaluation results as analyzed and reported by the Psychology Department of Georgia State University. Four years of evaluation results from Georgia State University consistently showed that a large majority of youth had made reduced or ceased alcohol, tobacco and other drug use at the time of the follow-up session. SUPER STARS, a related program for elementary school youth and their parents won two Martin Luther King Violence Prevention Awards from the Rollins School of Public Health at Emory University and a Promising Program Award from DHHS/SAMHSA/CSAP.